Ramen. In Japan it’s an obsession. In America it’s been late-night dorm room post-party munchies. In San Diego, though, 2015 saw a handful of shops grow exponentially and ramen become serious eats. 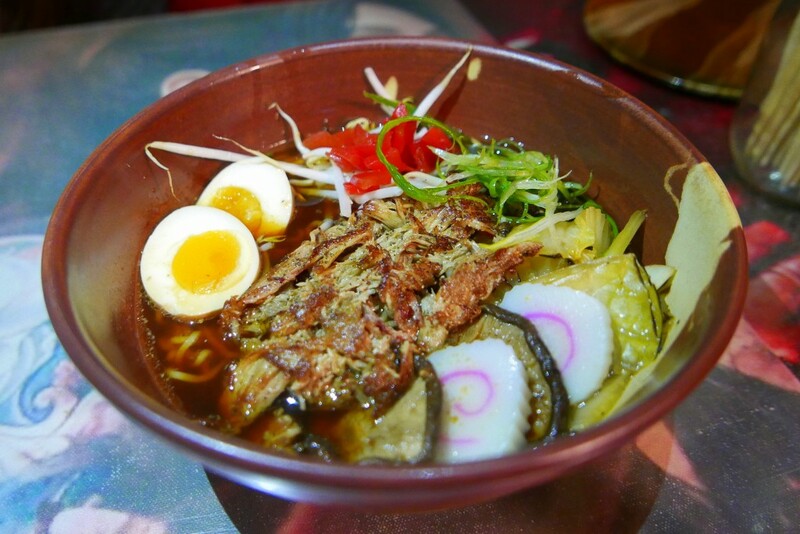 There are four major “types” of ramen in Japan: shoyu, miso, shio, and tonkotsu. Those four are divided into at least twenty regional variations, each of which is subdivided seemingly endlessly. Sometimes you suspect every town has its own distinctive version. At its most basic level, though, a bowl of ramen is four things: tare, broth, noodles and toppings, constructed in that order. Tare is the powerful, flavored essence at the bottom of the bowl that generally (but not always) defines the ramen’s “type.” Next comes the broth: pork, chicken or combinations of the two are most common but some variations use dashi, sardines, spicy bean paste or lard. The noodles for ramen are golden yellow, alkaline Chinese-style noodles. Perfect ramen noodles are firm yet supple with just a hint of a crunch. Topping options are nearly infinite, though nori seaweed, spinach, chives, chashu (roast pork), pickled bamboo shoots, egg and fish cake are common. 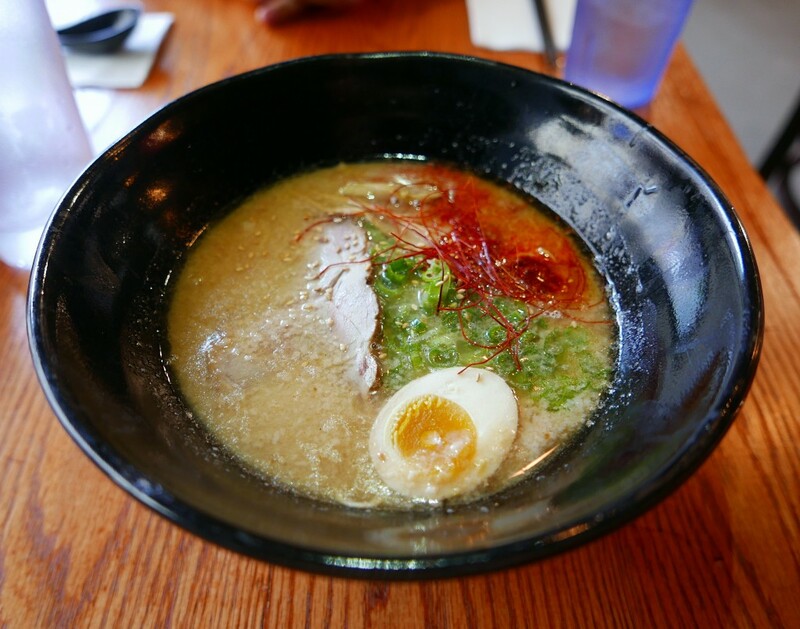 The most common ramen type in San Diego is tonkotsu, the one major style defined by the broth instead of the tare. For tonkotsu broth, 24 pounds of pork bones are boiled hard for 20 hours until they collapse from their own weight resulting in a milky white, deeply delicious, meaty broth highlighting savory flavors and umami warmth that is the very essence of pig. 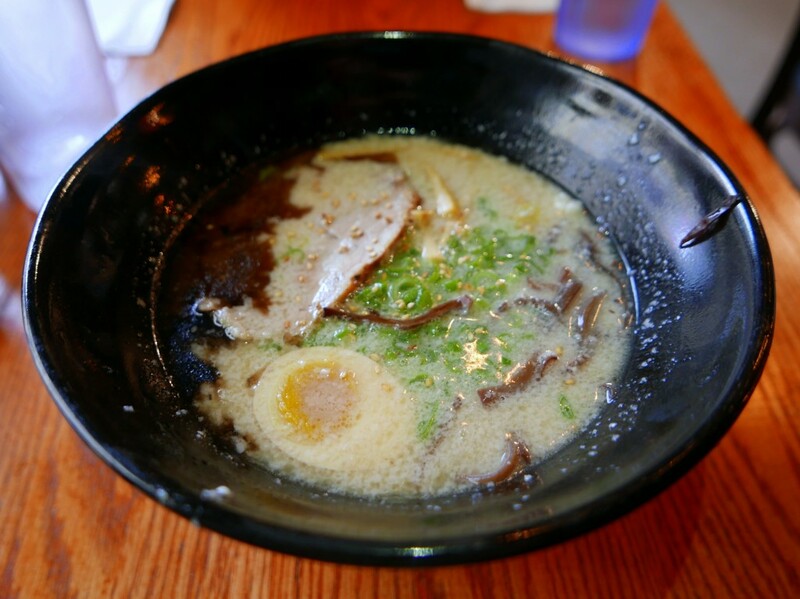 Some of the best tonkotsu ramen in San Diego can be found at Ramen Yamadaya’s new downtown location (531 Broadway) or Tajima Hillcrest (3739 6th Avenue, Suite B). Santouka Ramen (4240 Kearny Mesa Road) inside the Mitsuwa Marketplace offers an opportunity to do a quick ramen tour of several of Japan’s classic ramens. The tare for the shio ramen is based on salt (though, ironically, it ends up tasting less salty than other types). Miso ramen builds its tare on red soybean paste. The tare for shoyu ramen, the saltiest, is based on soy sauce. Santouka was the first Japanese ramen chain to hit San Diego (albeit in a supermarket). 2015 saw Santouka joined by Nishiki Ramen (8055 Armour Street, Suite 201A), across the same shared parking lot and Jinya Ramen Bar (825 Garnet Avenue) in Pacific Beach with a Hillcrest location on the way. Rakiraki Ramen and Tsukemen (4646 Convoy Street) offers an example of a relatively recent (mid-1950s) Japanese variation that became Tokyo’s “in” ramen in the 2000s. Tsukemen ramen is brought to the table with noodles separate from a piping hot bowl of thick sauce-like soup. The intent is for diners to dip the noodles themselves. Ramen innovation, at least in Japan, is accepted, respected and greeted with enthusiasm. That may be less the case outside Japan. One of the first of San Diego’s ramen innovators, Underbelly (3000 Upas Street in North Park and 750 West Fir Street, Little Italy), has been successful despite the fact self-appointed Ramen Police tagged it with the “inauthentic” label. Surely their topping combinations are far from traditional, but they work. The most recent addition to San Diego’s ramen scene is The Whet Noodle (1813 South Coast Highway, Oceanside) next door to Wrench & Rodent Seabasstropub. 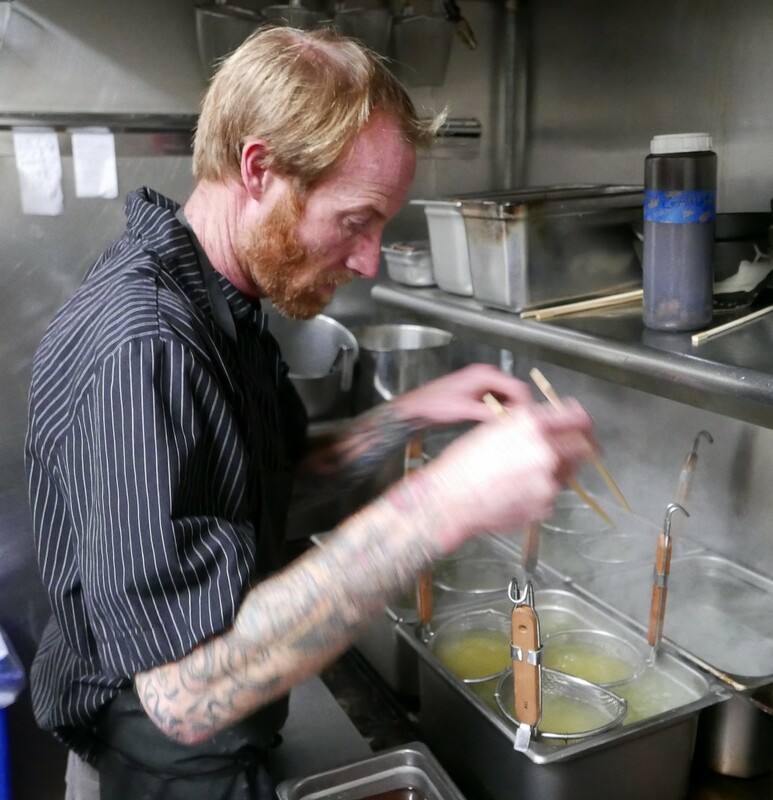 At Whet Noodle, Davin Waite does to ramen what he did to sushi at the Rodent, earning serious consideration as San Diego’s most consistently creative chef. Take, for example, his duck shoyu ramen. Japan, of course, knows no such thing. Built on a 50/50 tare of mirin and soy and a 50/50 broth of smoked and roast duck, the result is a soup featuring some of the body of a tonkotsu but with an emphasis on elegance. Mine came with toppings of pulled duck, lightly pickled egg, charred Napa cabbage, shiitake mushroom, fish cake, pickled daikon, scallion and bean sprouts. The Whet Noodle also offers a vegan option (hot and sour miso broth) with more styles to come. Waite is cautious about calling Whet Noodle’s dishes “ramen” but ramen is exactly what they are. Creative ramen, yes, but respectful too. San Diego is having its ramen moment. look for Beshock Ramen & Sake Bar from Japan coming to East Village Summer 2016. Tell me more about it. What style? What’s going to be on the menu? Oh….and where in the EV? It should be opening soon, and it’s at the corner of 13th and Market by EV Lofts. Yes! BeShock Ramen & Sake Bar is finally open 🙂 Please come check us out!